Abandoned dogs are flooding into the new Orihuela animal shelter, with around 20 arriving every week. Although it has only been fully operational for a few months the shelter is already at crisis point, with more than 200 dogs at the facility that was designed to take just 98. While the shelter is successfully finding new homes for many animals, dogs are coming in faster than they can be re-homed. The shelter has to take all abandoned dogs from the Orihuela municipality so cannot close its doors to new arrivals. The only hope for these dogs is if lots of people now come forward to offer them homes. Said shelter manager Virtudes Sanchis, “We have been completely shocked by the numbers of dogs being abandoned in Orihuela. We are up against a strong culture of abandonment, with dog owners thinking it is OK to dump their dogs when they are no longer wanted. Irresponsible dog owners are also allowing their dogs to breed indiscriminately and dumping litter after litter of unwanted puppies. Prior to the opening of the new shelter, the number of abandoned animals in the municipality was not so obvious as they were collected and destroyed without any real attempt to give them a second chance. Overcrowding the facility will cause a health hazard for the dogs, as it will be harder to provide high levels of care and to control disease. But the only real alternative is to euthanise animals, a measure the shelter is desperately trying to avoid. So shelter staff are calling on all animal lovers to help by adopting a dog if they possibly can. Every day is adoption day at the shelter but in an urgent bid to promote more adoptions, and to assist non-Spanish speaking people wishing to give a shelter dog a second chance, the shelter is holding a special adoption open day on Wednesday August 3rd when English and German speaking volunteers will be on hand to assist. The shelter has many beautiful dogs in desperate need of a home. There are lots of puppies as well as many big dogs such as Mastins, German Shepherds and American Pit Bulls. Large breeds are particularly vulnerable to abandonment as their owners often don’t realise how big they will become. There are also many small and medium sized adult dogs of every breed and variety at the shelter waiting for a new home. And, it’s not just dogs, there are around 30 beautiful cats and kittens seeking new owners, too. 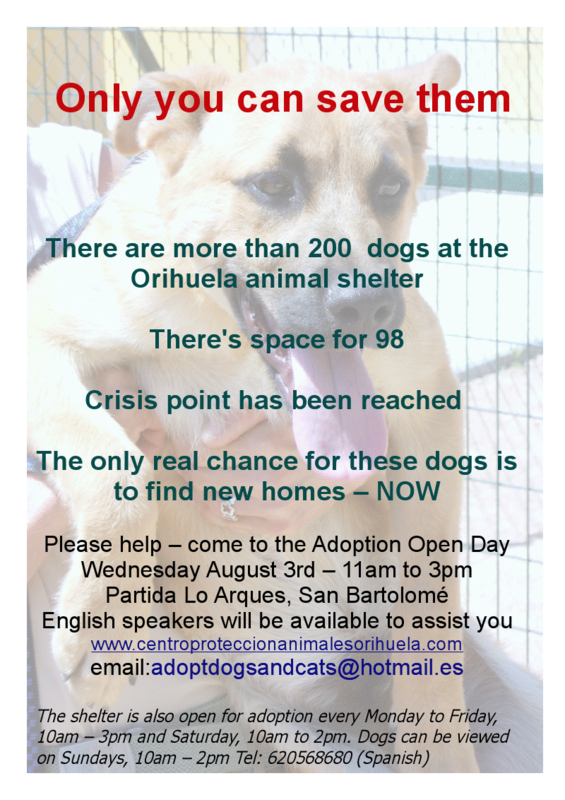 The adoption day will be from 11am until 3pm at the shelter in Partida Lo Arques, San Bartolomé, close to the Vega Baja Hospital – from the ITV station head toward the mountain, turn left at the second roundabout and follow the signs. 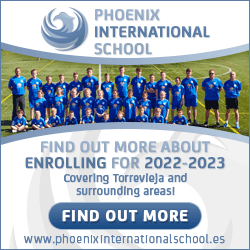 Visit www.centroproteccionanimalesorihuela.com and click under DONDE ESTAMOS for a map. Or email adoptdogsandcats@hotmail.es and state where you are coming from to get written directions. The shelter’s normal public opening hours for adoptions are Monday to Friday 10am to 3pm, Saturday 10am to 2pm. Adoptions cannot be finalised on Sundays but dogs can be viewed between 10am and 2pm.